Pipeline management is crucial for sales success. It will separate opportunities at different points within the sales funnel allowing you to look forward to the next week or next month rather than just the next day. 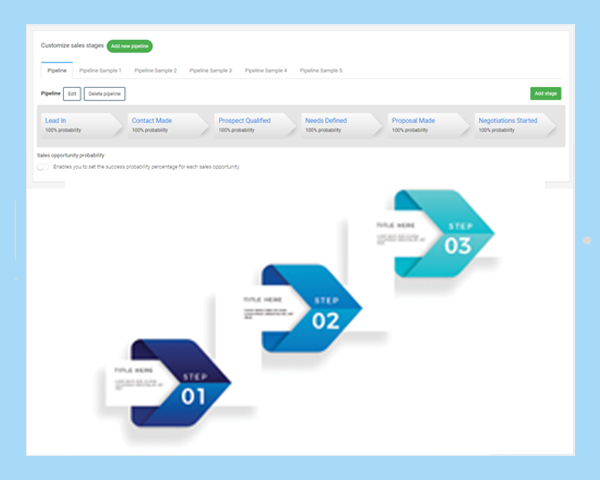 The clear management system also allows you to process deals quickly as slow to progress deals convert at a much lower rate that quickly progressing ones. Turbocharge your sales pipeline with Smarty’s cutting edge management tools. Get a clear, concise, actionable overview of your sales funnel to avoid missed opportunities and streamline the way deals are tracked and processed. Embrace a forward-thinking approach to sales that lets you look to the future, rather than just focusing on tomorrow’s prospects. 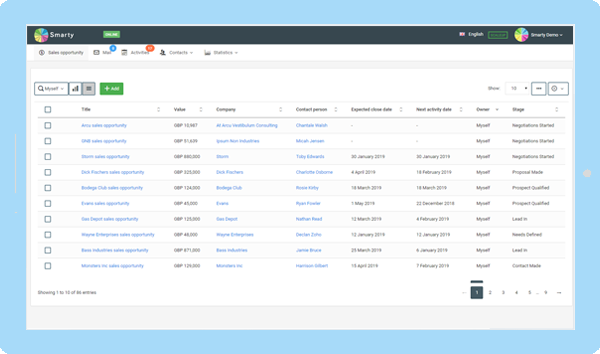 Focus your efforts and prioritise the most valuable prospective deals and avoid unhelpful distractions thanks to our attractive, intuitive interface. In pipeline management, clients and customer are categorised by the stage of sales or acquisition they are in. This gives you a neat categorisation to be able to see which actions need to be taken with which actual or potential client. The CRM means that clients will never fall through the cracks and be forgotten about. We all know that leads left cold or untreated for too long quickly become useless, so Smarty CRM will prioritise these contacts to ensure no opportunities are missed out on. For busy business owners working out your companies’ sales statistics is another task that you would rather not deal with. That’s why the Smarty CRM platform will centralise and organise all the statistical information regarding the pipeline management behind the scenes. If you request to see the health of your pipeline, the result can be delivered in the few seconds in the form of various different types of report or infographic. After, these can be saved, downloaded or converted to a Excel for printing. 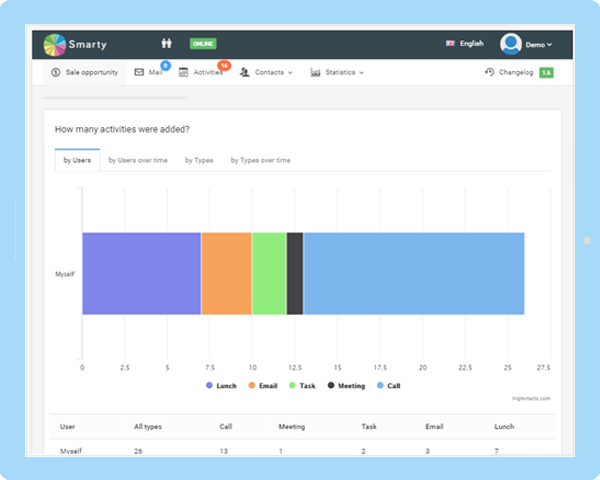 Smarty CRM can store an unlimited number of contacts and manage them all at the same time. 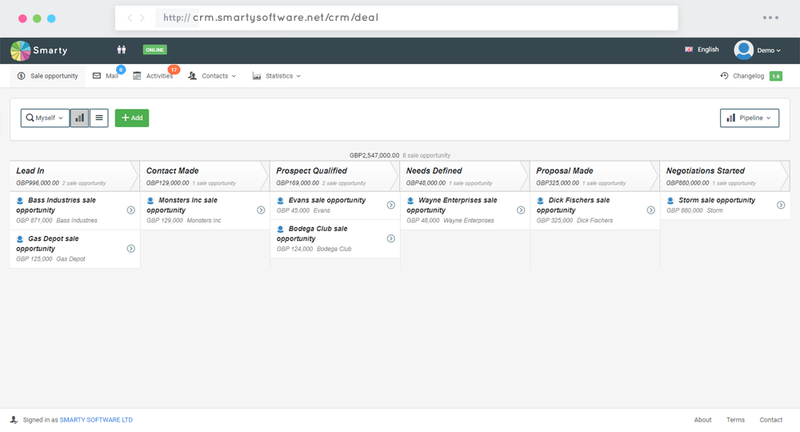 So, it doesn’t matter whether you are a bespoke business with ten clients, or a wholesale manufacturer with thousands, Smarty CRM will help you make your pipeline visible, clear and well organised. 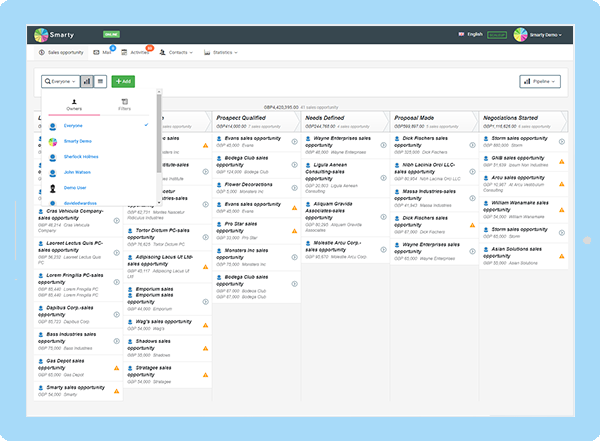 Complete visibility in your pipeline management means everyone, whatever position they hold in the business or where they’re working from, has a clear idea of what’s going on. This information is all updated in real time so there will never be any business lag where people are on different pages about a certain client or customer at the same time.